I contend that our astrological understanding of Scorpio and Pisces has been compromised by attributing qualities to those signs that more correctly belong to the outer planets Pluto and Neptune. We have taken Scorpio and Pisces too far out of the realm of everyday life and brought it too close to the extreme and the supernatural, and usually this is not where people live. There is a gap between what the books tell us about Scorpio and Pisces and the lives of our clients. Most people with prominent Scorpio are not obsessive or focused on death but are self-contained but engaged with life. Most people with prominent Pisces are usually interested in the world around them, even its details, and respond to life in many different ways. Last year I argued against bringing together houses, signs, and planets according to the “Twelve Letter Alphabet” (PDF file). And in a follow-up article, I looked critically at the modern affiliation of the sign Aquarius with the planet Uranus in Liberating Aquarius and Uranus. This current article is a companion to those two articles. When the outer planets Uranus, Neptune, and Pluto were discovered they soon made their way into astrology. 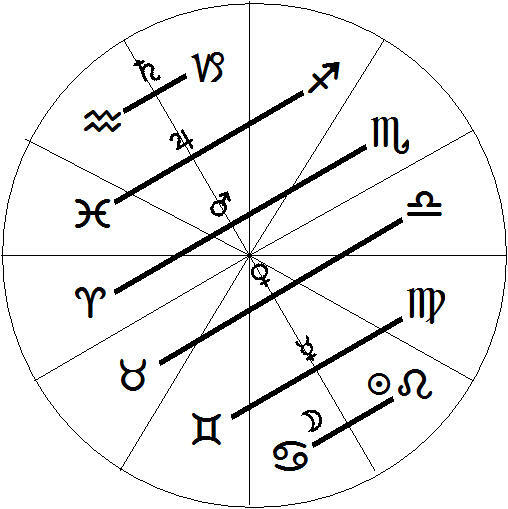 At that time astrologers changed the traditional pattern of planetary rulers or domiciles of the signs of the zodiac. Previously, Sun and Moon governed the signs Leo and Cancer respectively, then the five starry planets were given two signs each. See diagram on the right. The changed version used Uranus instead of Saturn as domicile ruler for Aquarius, Neptune instead of Jupiter for Pisces, and Pluto instead of Mars for Scorpio. Today some astrologers use traditional rulers only, some use modern rulers, others use “co-rulers”. Since my very first years as an astrologer I have only used traditional domicile rulers for Aquarius, Scorpio, and Pisces. In early 2015, I argued for liberating the planet Uranus and the sign Aquarius from being tied to each other because pairing them led to self-contradictory depictions for both sign and planet. (See Part Two.) This final essay, Part Three, completes the discussion, extending it to Scorpio and Pluto, Neptune and Pisces. There one strong reason for not using outer planets as sign rulers: you can’t debilitate an outer planet. Inner planets are altered by the environment of the sign in which that planet is placed – Moon’s nature and activity are enhanced by the fertile environment of Taurus, its exaltation, but compromised by being placed in Scorpio, its fall. Outer planets are fundamentally different: spending many years in a sign they are neither enhanced nor compromised by being placed in that sign. To use the old joke, an outer planet, like the 800-pound gorilla, sits wherever it wants. The sign of an outer planet indicates a historical or generational influence and it has a personal influence only when the outer planet makes contact to a personal planet. If you see a table with rulers, detriments, exaltations, and falls listed for outer planets, just turn the page or exit the document. In July 2015 the NASA spacecraft flew past Pluto and took many pictures, and at this writing we are waiting for the resulting data to be analyzed. During the flyby we saw Pluto’s irregular marked surface with massive mountains of ice and that it has an atmosphere of sorts. The rocky solidness of its surface tells us that, symbolically, Pluto is a different entity from the gas giants Jupiter-Neptune. Pluto seems closer in type and symbolic nature to the distant Eris, a more recently-discovered planetary body named after the Greek deity of discord, than to Uranus and Neptune that are closer. 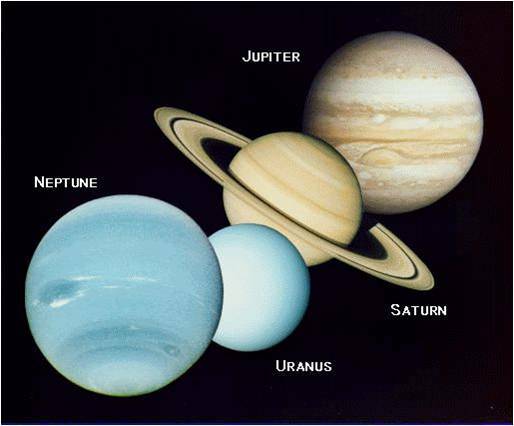 I will discuss the four gas giants as a continuum when we discuss Neptune. For the past generation astrologers have described Pluto in a consistent manner as a dark planet of the underworld, death, and power. For example, here’s the description from astro.com: “Pluto describes how we deal with power, personal and non-personal, be it through suffering the power of others or exercising it ourselves. It describes how we meet the demonic and magical, our regenerative powers and our capacity for radical change and rebirth: the cycles of dying and becoming.” There is much discussion of Pluto’s role in transformation. In modern parlance it is common for people to look at important changes – relationship or marital status, professional change or moving, even starting a yoga class on Tuesday nights, as “transformative.” However, these changes seem more part of normal life and normal adult development and they usually occur within other defined structures; they are therefore more like “first order change” – there is alteration but the organism or individual, maintains its continuity. This is not the kind of change to consider when we describe astrology’s Pluto. The word “transformation” is defined as a change in form, shape, or appearance. Its Greek equivalent is “metamorphosis” and, we know from Ovid’s famous poem of the same name, metamorphosis not always an improvement. Positive transformation is rare in our lives. 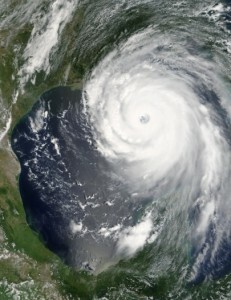 Most transformations or metamorphoses are kindled from life-shattering events: Near Death Experiences, visitations from angels or aliens, warfare, imprisonment or becoming a victim of a violent crime, natural disasters, grave economic collapse, life-threatening illness or disability, or when one loses loved ones and home, like when the tidal wave and nuclear disaster happened in Japan or when Hurricane Katrina hit. This year’s news is filled with stories of boatloads of refugees fleeing the Middle East and North Africa for Europe, and what happens to some who stay home. Here we encounter life’s essential fragility, sometimes the impinging presence of evil, including that which is within us. These are involuntary changes that are more like “fate”. As a consequence of these events we might get PTSD or an array of other symptoms and negative outcomes, we may become hollowed out like the ghostly beings in Tolkien or the Harry Potter series, or we become creative or brilliant, a “victorious personality” worthy of admiration and even reverence. For victorious individuals, horrific life events become spiritual openings. These positive outcomes occur far less frequently and they seem connected to a complete acceptance that life cannot ever return to normal. There are also voluntary transformations that ignited by the simple reality we all touch upon when contemplating our own death and those of our loved ones. Fundamentally we and all we know are “at death’s door”. It’s no surprise that the great paths of spiritual transformation usually begin by stressing the contingent and temporary natures of our lives, our essential frailty. This allows us to turn fate into calling. These changes in outlook can also result in transformations symbolized by Pluto – if we are up to it. Pluto is the planet of the other, of the alien, of the indifference of the universe, but this is what sets the stage for transformation. When we look at Pluto in terms of the Underworld, these themes continue. It’s helpful to look at literary depictions of the Underworld and its place in ancient narrative for here we find important insights. We may think of the underworld journeys of Odysseus and Aeneas depicted in Odyssey Book 11 and Aeneid Book 6 respectively. In both epics, the heroes go under to gain connection and personal strength, greater understanding and a sense of purpose and they will need it. After returning from the Underworld both Odysseus and Aeneas encounter calamity, but both have acquired an ability to accommodate adversity, to weather upcoming storms, to come out on the other side. In the ancient epic tradition the most valued prophecy is that which comes from the Underworld, for this realm discloses truth in all its nakedness and inconvenience. Astrologers judge wrongly when they say that a prominent Pluto in a natal chart signifies a transformative life, for most of us resist real transformation regardless of the Pluto’s placement in our astrological charts. Ordinarily Pluto will not transform us, for we don’t like too much “transformation” or even change. Then how do we look at Pluto in the natal chart? Instead of looking at the sign Pluto is in, we must consider how Pluto aspects the natal angles (especially the Ascendant and Midheaven) and the quick-moving personal planets – by conjunction, opposition, and square. This will show Pluto’s range of influence. In this way, prominent Pluto in a natal chart can show the content and direction of an underworld journey or of transformative occasions, even if those we encounter do not ultimately serve to increase our strength and understanding. Transiting planet Pluto acts as a corrective to our shallow complacencies, can lead to some greater understanding and sense of purpose, but not necessarily. Remember that transits are transitory and point to life circumstances as they change for us, not as a guarantee of permanent growth or positive transformation. Even those who are more even-handed and emphasize a transformative nature of Scorpio can get into the trap of making distinctions between “un-evolved” evilly-inclined Scorpios and those “evolved” ones who have such personal presence that they can change the world. There are those who are truly evil or who can change the world for the better, but does this happen more frequently with Scorpio than other signs of the zodiac? Most people I know with prominent Scorpio have jobs, relationships, family, personal aspirations and difficulties, health concerns. They are very much like other people. There is nothing innately more difficult about Scorpio than other signs of the zodiac. We should start over and describe Scorpio using three simple categories: mode (fixed), element (water) and traditional governing planet (Mars in its feminine aspect). This will help us understand better Scorpio’s nature and quality. The “fixed” part is very straightforward – like other fixed signs Scorpio is steady, relentless, persevering, holding its position. This may result in heroic endurance or stubbornness past the bounds of reason. I remember one client with five planets in Scorpio tell me that after her first impression of somebody never changes (I must have made a good first impression). Fixed Scorpio does hang on – but, I contend, Scorpio “hangs on for dear life”, not to death. The element water gives a downward-moving nature that comes in many shapes, for water has no natural container. The element water is in greater attunement with the life of the emotions but is not necessarily overcome by them. Signs of the elements water and earth are the so-called feminine or yin signs and their energy naturally gravitates toward containment and quieter, more hidden expression. One would expect a deeper emotional life for Scorpio than its opposite sign Taurus in the earth element, and an inward perspective not associated with the signs that square Scorpio – Leo and Aquarius. These two signs that square Scorpio tend to be attached to their presentation (Leo) or their concepts (Aquarius). In turn Scorpio may become attached to emotional responses and the inner dimensions of life. Mars in its feminine domicile adds to Scorpio’s downward power of the water element and its fixed mode. Who is feminine Mars? It is not the Aries-like Mars that’s outwardly fiery and boisterous but a one that’s quieter, more subtle, more below the surface, and more penetrating. Ancient writers of astrology asserted that Mars was a more positive planet in Scorpio than in Aries – Mars in Scorpio has an agenda, subtlety, and effectiveness. 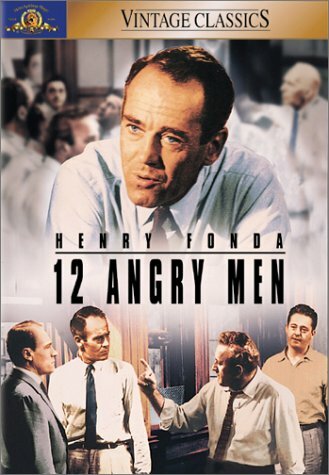 In a group they can see the behind-the-scenes jockeying, games of envy and attraction, quiet undermining of perceived competition: these are common in board rooms, conference rooms of yoga studios, meditation centers, even within astrology organizations. Scorpio Mars is uniquely qualified to handle this environment and to respond in a measured and timely way, when its own emotionality doesn’t get in the way. Scorpio is also good at plotting comebacks and quietly preparing its revenge, like the patient protagonist of The Count of Monte Cristo. 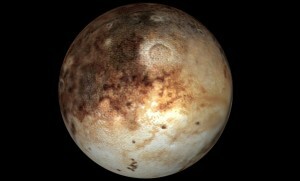 These features are not Pluto but a different Mars. 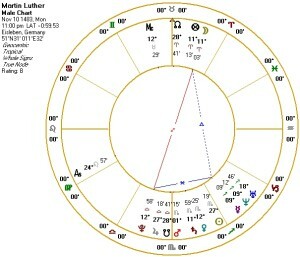 Martin Luther’s chart and life show qualities of both Pluto and Scorpio if consider them differently. As we all learned long ago, Martin Luther was the sixteenth century German monk and Professor of Theology at Wittenberg. He publicly objected to some of the practices and supporting theology of the Catholic Church. 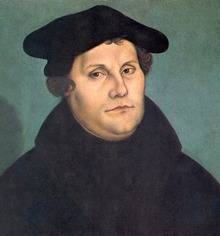 Aided by German princes and a population resentful of their money bankrolling the Italian Renaissance, Luther launched the Protestant Reformation. 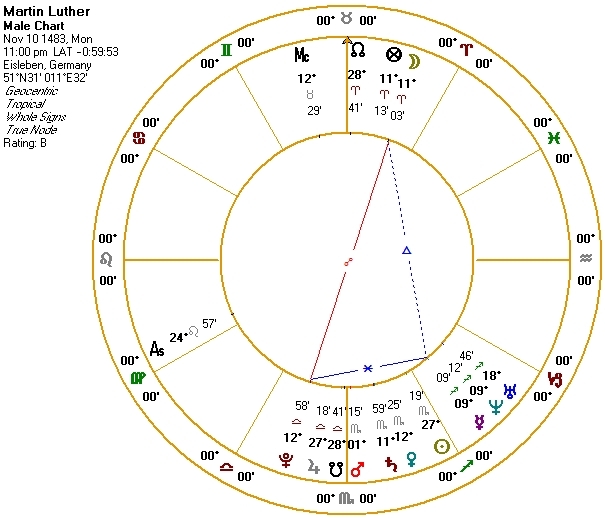 If we look at Luther’s Pluto we first need to note the positions of his Moon and Mercury, since outer planets gain significance through their aspects to inner planets. Both Moon and Mercury are in fire signs, Moon in Aries (in the 9th House of Religion, conjunct the Lot of Fortune) would give him impulsiveness and a pioneering instinct even within a traditional religious environment. At different times of his life he had to respond quickly to changing circumstances and his instincts were often correct. Luther seemed to have made the most of Pluto and its ability to transform the individual. 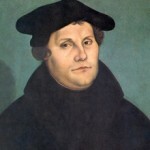 Prepared by a difficult upbringing and his devotion to Christian doctrine, Luther probed the basic meanings of doctrine and applied it to his life and it helped him change from a highly neurotic young adult to somebody who could open up new ways of living for others. Pluto, a slow-moving planet that can also show how the individual and his or her times intersect, also helped Luther connect to the larger field of European politics and the changing ways of thinking at the dawn of the modern age. Luther had plenty of Scorpio that manifested in other features of his life and work. Scorpio Sun governs his Leo Ascendant; He never considered himself a public person and subordinated his fame to his larger cause. Venus conjunct Saturn in Scorpio corresponds nicely to Luther’s youthful difficulties accepting his own sexuality and his later advocacy for married clergy. Mars is in its own domicile in Scorpio and is domicile lord of his Sun, Venus, and Saturn – and Moon in Aries in his Ninth House. One can look at his early years of gradually putting together his objections to Catholic doctrine that would later spring forward as a completely worked-out alternative to the Catholic tradition. Once he entered public life as a critic of the Church he pursued his purpose with focus and courage, only gradually making the transition from loyal advocate of reform to religious revolutionary. Luther’s Scorpio demonstrates well the sign’s fixed mode, water element, and its rulership by a feminine Mars. Pluto is different. Now we turn our attention to Neptune and Pisces. Let’s first consider Neptune as the outermost of the gas giants, the final planet of a series that begins with Jupiter and continues through Saturn and Uranus. Symbolically, the gas giants successively expand the horizons of life, taking us from the conventional toward the metaphysical, from the personal toward the transpersonal. Along with Pluto, the gas giants relate to larger historical and generational trends. Jupiter, the greater benefic and the gas giant closest to us with the swiftest orbit, is the most familiar of the four. Jupiter enlarges life from the personal to the community or tribal, or from the local or tribal to the national or global. Some people of the nature of Jupiter are inclined toward religion and philosophy as way to connect with larger truths but this occurs within given social or cultural contexts. Jupiter is a good citizen, operates within a framework of convention, and is often the planet for increasing wealth (not Venus) and community. Saturn makes one’s horizon larger and stretches boundaries further but in a different way from the feel-good nature of Jupiter. As the planet of melancholy and also that of contemplation, Saturn at its best forces us away from self-absorption and complacency, from procrastination and comfort. Most of us turn our backs on Saturn’s invitations to drop these limiting factors and Saturn becomes for us the “greater malefic,” the planet of burden and the oppressiveness of reality. As the first of the invisible planets Uranus is an outlier, the planet of genius, intuition, the higher mind that thinks broadly. Uranus takes us beyond expectation and forces us to leave old assumptions behind. Uranus allows us to glimpse the transformative quality of the present moment, even if we cannot stay with the present moment for more than half a minute. As discussed in Part Two of this series the fixed sign Aquarius cannot keep up with Uranus’ suddenness or its genius. We finally arrive at Neptune. The large blue gas giant takes apart conventional reality by disclosing its dream-like nature, potentially opening us up to vaster worlds. Neptune can take us above or beyond our tendencies to think of ourselves and our world as having boundaries, labels, even true existence. This opening can bring us closer to divinity, can bestow upon us the ability to imagine and enact alternatives, but may also seduce us into dissociation, denial and dreamy illusion, avoidance fantasy and paranoia. Neptune signifies the first steps of “transcendence”, stepping over or beyond, but also what happens when our secure lives fall apart and we freak out. Those with prominent Neptune can be idealistic, visionary, and sometimes unbelievably misguided or degraded. Astrologically what makes for a prominent Neptune? As with Pluto, contacts made to angles and faster-moving personal planets reveal the facets of life that may be influenced by Neptune, for better or worse. We saw this above with Neptune in Martin Luther’s natal chart. Neptune transits can be quite difficult, sometimes prompting me to call Neptune the “greatest malefic” –they are often times of mental or emotional fuzziness, but also delusion and even dissociation. Things fall apart. Spiritual openings can also occur but usually only if we’ve previously worked to prepare for them. Pisces is a sign and not a planet and is on a different order of reality from Neptune. Because Pisces is a sign of the zodiac, its influence is primarily worldly, not otherworldly. Pisces as a sign is not a gateway to transcendence or illusion but just one of the twelve possibilities for human existence, depending on planets or angles placed in that sign. Unfortunately, most modern descriptions of Pisces have become saturated with the symbolism of Neptune and have become distorted. Here are the keywords for Pisces from the NCGR Certification Manual cited above: “imaginative, self-sacrificing, impressionable, sympathetic, compassionate, illusionary, secretive, victimizing or victimized.” Of eight labels four seem to be more about Neptune than Pisces. If we stay with the basic traditional symbolism Pisces’ nature and activity become clearer. Again we begin with mode and here it’s not fixed like Scorpio but mutable: changeable, inconsistent, and capable of many identities, interests, and presentations. Mutable signs are less inclined to start things, waver when perseverance is called for, but is greatly adaptable to changing circumstances. When we add the element water to the fixed mode, we add emotional impressionability and sensitivity to inner world of oneself and those of others. Water and mutability together disclose the illusory quality of our lives and life in general, yet this does not have to become otherworldly. Like Gemini but in a less playful manner, Pisces assumes many disguises and phases, revealing itself differently in different situations, often being mysterious to oneself. Pisces is capable of immersing oneself into an environment completely – and then into another one later. This is sometimes a virtue and sometimes a failing. Watery Pisces opposes the earth and mutable sign Virgo that focuses on concrete situations and practical outcomes; Gemini and Sagittarius, signs that are more conscious and intentional and mental, both square Pisces. As the water sign of the mutable cross, Pisces has more emotional sensitivity and perceptual depth but sometimes lacks accountability and productivity. As Mars differs between its masculine presentation in Aries and feminine presentation in Scorpio, the domicile ruler of Pisces, feminine Jupiter, differs from masculine Jupiter the Sagittarian. Feminine Jupiter is less ideological and righteous, more inclined toward changing perceptions and viewpoints and more aware of the hypocrisies of applied concept. This creates for Pisces a personal and sympathetic attitude based on feeling and intuition without the fantasy of saving the world or converting others to its own form of being right. One very articulate expression of a feminine Jupiter is by Mark Twain (whose Jupiter in Cancer dominates his chart) from his novel The Adventures of Huckleberry Finn. The protagonist has run away from an abusive environment and has joined forces with the runaway slave Jim on a river raft. Huckleberry Finn knew from an early age that harboring runaway slaves was illegal and immoral, yet with him was a human being with whom he had a personal connection. He had written a letter to the authorities turning in Jim as a runaway, but, acknowledging that he could find nothing bad to say about him, reconsidered sending the letter: “all right, then, I’ll go to hell – and tore it up.” In the novel Huck Finn is sure he will be personally damned by his familiar society and God, yet more important was his caring relationship with the runaway slave, an example that shows how the novel’s title character is the true moral center of the novel’s action. 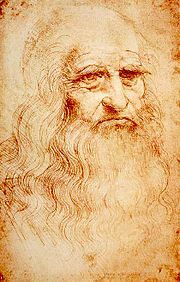 Here’s an individual who hardly needs an introduction, Leonardo da Vinci of the generation before Luther, the famed Italian “universal genius” of art, science and engineering. Additionally he was a pretty good musician. Leonardo’s lifetime is itself a tour of the Renaissance, beginning in Florence, moving to Milan, eventually becoming advisor and engineer for Cesare Borgia in central Italy, and ending his years in the employ of the King of France. I invite the interested reader to study him, for Leonardo’s was an outstanding life that puts on its head many of our assumptions about human capability. 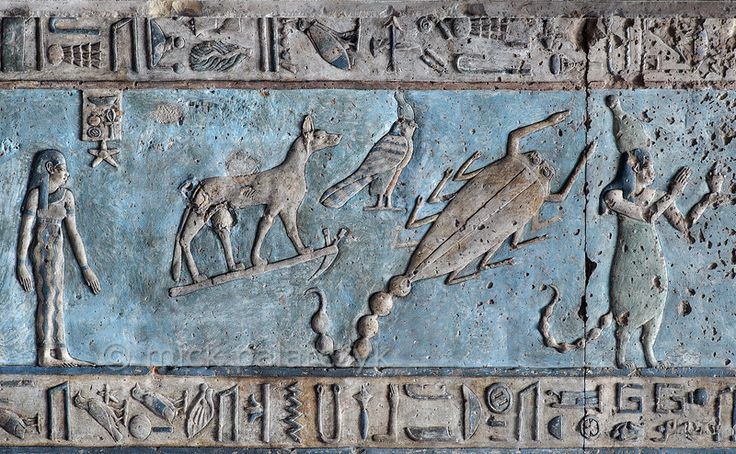 One cannot find an astrological signature for “universal genius”, but some facets of his life show the influence of both Neptune and the sign Pisces – but we must consider them separately. 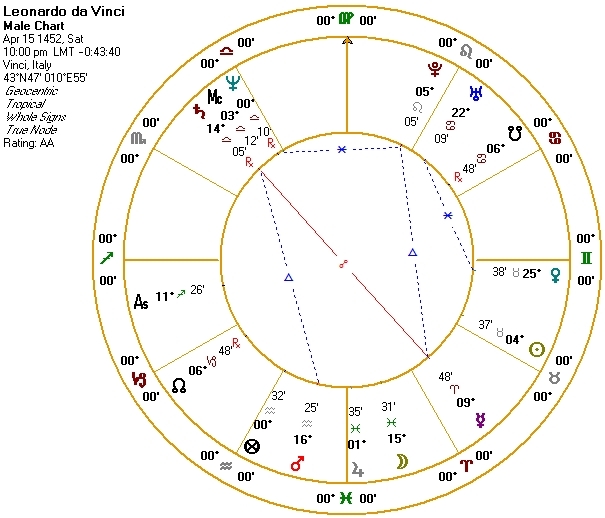 Two birth times are given for Leonardo, 9:40 and one for 10:00 PM that gives Neptune conjunct the Midheaven degree. 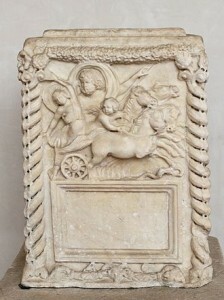 It is surely tempting to place Neptune at Leonardo’s Midheaven degree, not because he was particularly spiritual – he comported himself mostly like a secular celebrity – but because of the fluidity of his life work, his ability to obscure boundaries between intellectual and artistic disciplines. That’s the Neptune part. 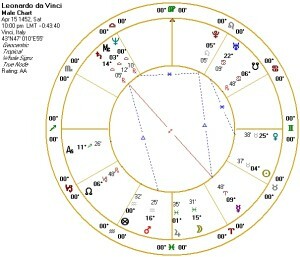 Jupiter in Pisces, angular in the 4th House, governs Leonardo’s Sagittarius Ascendant and Moon is also in Pisces. For better and for worse he exhibited many of the qualities of that sign. Leonardo’s Jupiter in Pisces, governing both Ascendant in Sagittarius and Moon in Pisces, has no interest in ideology but certainly could read people well and had a natural sympathy for them. Leonardo also demonstrated the less-admired qualities of mutable water – he was notoriously negligent with his commissioned works, often moving away from a promised work once he solved its problems and lost interest. His penchant for trying things in many different areas left much work incomplete. Yet in many ways – as that of a military engineer, for example – Leonardo was a practical person. Looking again at his Pisces Moon, we notice that it is in antiscia to a dignified Saturn (symmetrical to the Cancer-Capricorn axis). For him Saturn’s influence was more his loyalty to what he could learn from a work than the work itself or to his wealthy or well-connected patrons. The next Piscean individual is exemplary but in different ways. 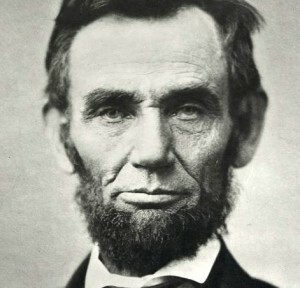 U.S. President Abraham Lincoln had the personal ill-fortune to govern the United States during its Civil War in the 1860’s. Of all American historical figures Lincoln’s life has been the most documented and has been written about more than anyone else. Unfortunately the most we know about his birth time was that he was born “around sun-up”. Here is his chart anyway. I’d like to focus on the increasing brilliance of his ideas and their articulation he endured the Civil War as President and saw it through to the end, after which he was assassinated. This means we focus on Mercury, the planet of words and ideas and messages. 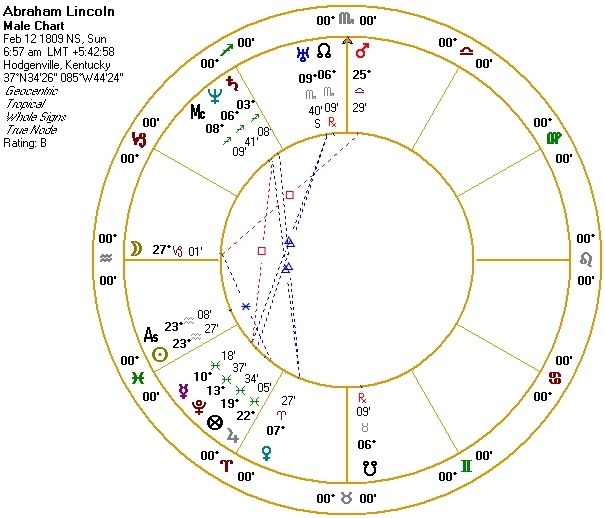 Lincoln’s Mercury has the distinction of being aspected by all three outer planets: a trine from Uranus, a square from Neptune, and is moving toward a conjunction with Pluto. These are strong influences but would be shallow if not for the essential condition of his Mercury placement. Mercury, moving swiftly, departing from the Sun’s rays and 17’ from the Sun, could be visible in low western sky. This attests to his ability to think independently and strongly but still doesn’t capture Mercury’s nature. In Pisces Mercury is in detriment and fall, and if you were looking at one of those essential dignity tables Mercury is docked fourteen points – not a good judgment for someone whose last speeches are one of the staples of American literature. Conforming to the combination of mutable mode and water element we have seen in Pisces, Lincoln’s Mercury is nonlinear, emotionally impressionable, and imaginative. This can show up in negative ways: during the early years of the Civil War Lincoln was often indecisive and vacillating. Nor was he a particularly good military leader – Franklin Roosevelt was much better, but Lincoln didn’t have Winston Churchill as self-appointed best friend. 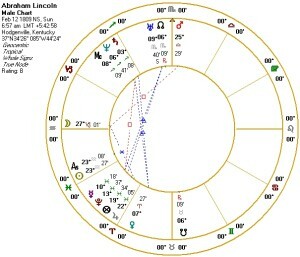 In Lincoln’s chart Jupiter in Pisces is conjunct the Lot of Fortune and the dispositor for Lincoln’s Mercury. The pieces now fall into place. 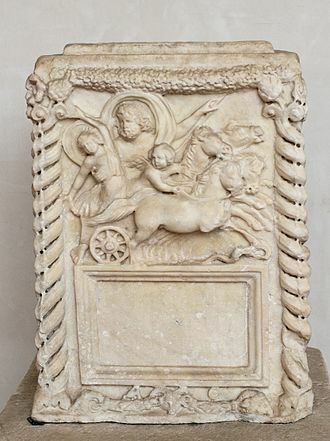 Jupiter (especially with its contra-antiscion relationship with Venus) had a great deal of personal sensitivity to go along with his articulation of national purpose, one that he arrived at not as a firm set of beliefs but as an evolving understanding. Lincoln’s ability to think of history and nation in personal terms (feminine Jupiter) and his emotional attunement stems from Pisces’ strong human sensitivity. Lincoln was not a religious man but he used the prevailing Christian religion to derive comfort and communicate meaning from the national calamity over which he presided. He was able to extend his own personal suffering (his own bouts of depression, loss of a son in the war, a wife with mental illness) to others and to the nation as a whole, even to the other side of the Civil War, the Confederacy. Through his personal and his nation’s calamity Lincoln demonstrated some of the best possibilities for planets in the sign Pisces. For Martin Luther, Leonardo da Vinci and for Abraham Lincoln, if we merge the significations of zodiacal signs with outer planets we miss the impact of outer planets aspecting inner planets and the further information from inner planets when placed in the signs Scorpio or Pisces. 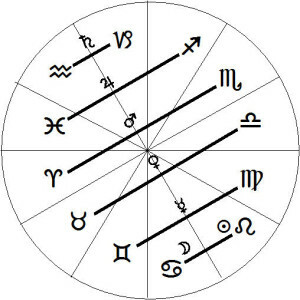 Merging symbols makes the astrologer’s interpretative work harder and may cause him or her to miss important dimensions interpreting the natal chart. In Part One of this series I argued for separating signs from their so-called “natural houses” that merge planet, sign, and house. 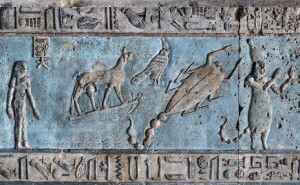 In Part Two and here in Part Three, I have argued for separating the zodiacal signs Aquarius, Pisces, and Neptune from the outer planet Uranus, Neptune, and Pluto. That way we can get the most out of both outer planet and zodiacal sign placements. It is unfortunate that introductory astrology books, websites, and planet delineations continue to use these correspondences from the Twelve-Letter Alphabet and rulerships by outer planets that do not hold up to close examination. This makes it difficult to apply astrology to ordinary life situations of ordinary people and runs the danger of reducing the range of astrological delineation to psychological and spiritual (or pseudo-spiritual) dimensions alone. I hope that over time we can do a more complete job. This is one of the best written pieces on astrology I have read in many months. Bravo – for successfully challenging assumptions of the modern planets! You give the signs and outer planets more credence by viewing them as outside of their modern rulers.